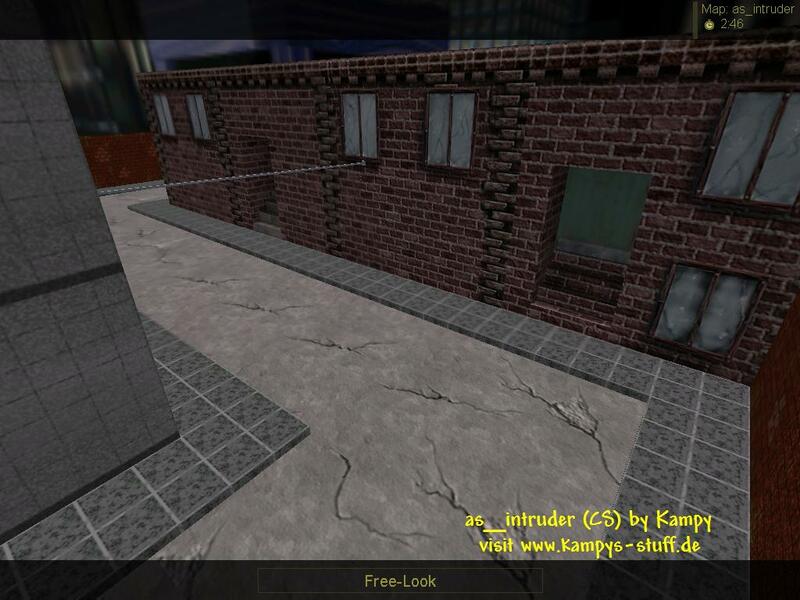 The idea behind as_intruder is an escape through a city which means you climb through windows and go through backyards and stuff. I also wanted to give AS_maps more action. This is a very fast paced as_map. Both teams have to hurry a lot so that they're faster than the other team. If the terrorist dont hurry they will miss the VIP going straight through their base. And if the CTs dont hurry the terrorists can build up a very strong defense, so this is a map for Counter-Strike pros or at least for those who know CS very well. 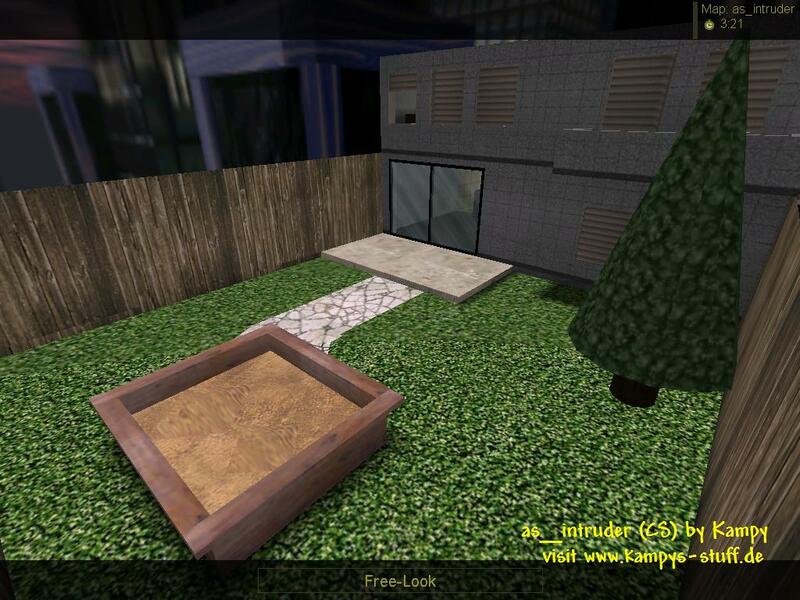 The Counter-Terrorists start at a nice family house with a garden. They can leave through the door or the window, although the window is only used for defense if the CT's are constantly rushed (the CT base is easily defended). Then they cross the street and go into an industrial building with a backyard that leads to the back a storage hall. On the front of this hall theres the street where you find both of the rescue points. There's also the terrorists base which is a building that contains "sweet_home3" (my flat and HL-map). Right and Left of the T-base house are the rescue points. There are three ways to enter the street: backdoor & frontdoor of the storage hall and its backyards sidegate. There's one special way for VIP protectors - they can give covering fire through a window of the storage hall - this is a huge atvantage, because you can see most of the street there. 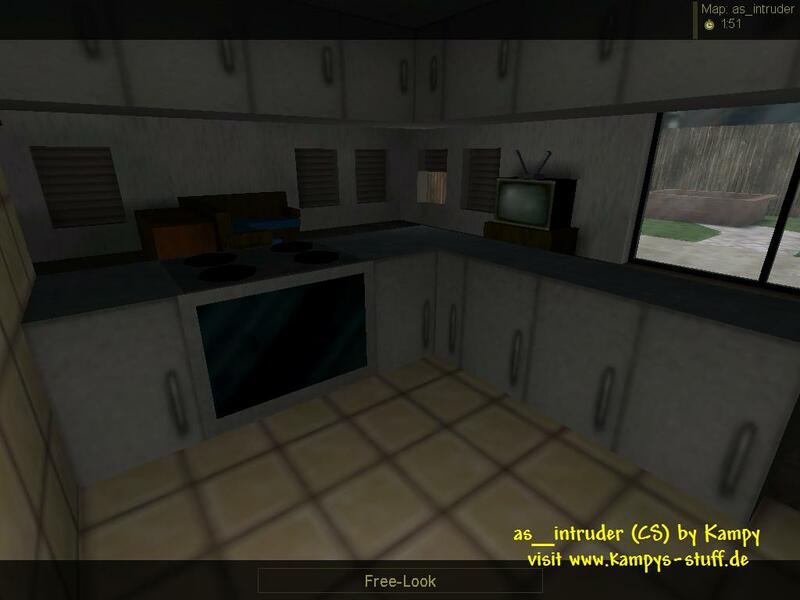 The terrorists have the atvantage to stay inside of "sweet_home3" and shoot out of the windows. All in all it has a simply action loaded gameplay. The grafic has some pretty cool aspects, but has some stuff I would have made much better if I think about it now. For example: on the street with the rescue points there are no windows at the side of the house, but those you can go through from inside or inside the industrial building there is an error - you can see another small part of the map through the sky. By the way this map contains my first self-made textures. The r_speeds are very low thanx to a lot of work at the construction. Back to the gameplay I have to add that it's very balanced although you might not think so at the start. If both teams know all the ways and tricks it should be a super-fair game which allows a lot of team stategy when you storm/defend the last street. This map is for those who like VIP maps with more action in it. - there's an extra way go through the left room of the ind. building then climb through the window where you see some boards layed from window to window.